Man (or woman) does not live by wine alone. Up and down the valley, you can feast with all the senses – our many art galleries and museums are as much an attraction as our renowned tasting rooms. Any art tour of the Napa Valley should begin at di Rosa, an eclectic and provocative preserve in the Carneros region that’s believed to be the largest collection of contemporary Bay Area art in the world, showcasing works by artists whose styles include abstract expressionism, figurative art, and conceptualism. Nearby is the Hess Collection – Donald Hess is known for limiting his focus to 20 living artists whose work he faithfully supports over long periods. He has developed an intimate dialogue with each artist to fully understand his or her artistic objectives. 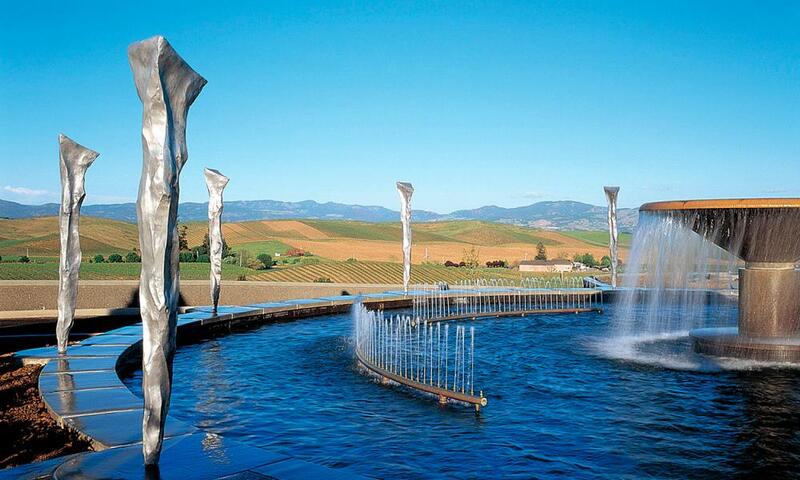 Since 1997, Artesa Winery has featured the work of artist-in-residence Gordon Huether, who creates large-scale glass, metal, and canvas sculptures exclusively for the winery. Huether’s work is also displayed at nearby St. Supery Vineyards and Winery, and in Huether’s own studio space in Napa. Also in downtown Napa, check out the jury-selected Napa Artwalk which has presented a striking, collaborative sculpture exhibition along Main and First Streets since 2010. The current show of fifteen sculptures (all relating to the theme of Metamorphosis) was due to end in May 2015, so look for announcements of a new installation. If you’re an art-lover visiting Yountville, be sure to visit the Napa Valley Museum, which features rotating exhibits as well as a retrospective of the land and people. Yountville also has a number of smaller galleries, including Gallery 1870 (in the V Marketplace), the Blue Heron Gallery, the Gordon Gallery, and Ma(i)sonry. The latter venue is a winery and gallery collective that allows the visitor to taste and view great art in an elegant, bucolic setting. Approaching St. Helena, you’ll know you’ve arrived when you spot sculptor Lawrence Argent’s 35-foot-tall stainless steel “Bunny Foo Foo” literally hopping out of the grape vines. The controversial sculpture is becoming accepted and even loved by the locals, and marks the entrance to HALL Wines, with its own extensive art collection. Guests are invited to enjoy its Wine and Art Exploration experience with works by such internationally acclaimed artists as John Baldessari, Jim Campbell, Nick Cave, Jaume Plensa, and Patrick Doughtery, and Peter Wegner while tasting some of HALL’s renowned wines. On St. Helena’s Main Street, you’ll find several smaller galleries featuring contemporary art, including Aerena, Christopher Hill, and Caldwell Snyder. And in Calistoga, the valley’s northernmost town, you can browse at Lee Youngman Gallery for traditional landscapes and abstracts or Indian Springs Art Gallery for figurative or abstract sculptures. Ca’ Toga Galleria d’Arte is a Venetian-inspired gallery featuring fanciful paintings, sculpture, murals, and ceramics. Finally, you’ll want to mark your calendar for Napa Valley’s annual Arts in April event, a month-long celebration of art. You can also get maps for ARTwalk sculpture tours in both downtown Napa and Yountville. Whatever your taste, you’ll find the Napa Valley filled with exciting, provocative art works to indulge all your senses. Just one of the many reasons to spend a few days here enjoying the artistic, wine-country lifestyle.